I quite often see these kinds of posts for pale skin, however it's just as tricky when most 'bronzers' literally just fade into your skin tone! Therefore I thought I'd do a post for those of you around the NC38-42 mark who read my blog for these sorts of suggestions, and anyone fairer who maybe fancies trying something a little different! Some people may wonder why I bother with bronzer at all, however the natural, sun kissed look is something you can love regardless. These are the bronzers that both actually show on my skin tone and have lovely formulas, and I've gone for a mix of warmer and cooler tones as well as both shimmers and mattes. KIKO Flawless Fusion Bronzer Powder in 05 Biscuit | £12.90 | Sadly one of my all-time favourite matte bronzers was a limited edition one from this brand, however I found this in their permanent line and it's almost as good! It's a pretty warm tone and has a soft, easy to blend formula. The pigmentation is just right because it shows on my skin without me having to layer it up. The tone is also spot on because it adds warms without being orange, which can be quite tricky when you have a warmer skin tone. I actually really like the packaging of this; it feels quite premium and you actually get a lot of product in there for your money. Models Own Sculpt and Glow Contouring Bronzing Powder 02 Deep Tan* | £8.99 | The packaging of this could be a little slicker, however don't be fooled because the product inside really is great! I personally wouldn't contour with this because, although it has a cooler tone than some of the others in this post, I would still say it's a warm shade (especially if you don't have a warm skin tone to begin with). It's actually pretty pigmented but I don't find it hard to blend out at all (the texture is quite soft and easy to apply). It adds a really natural warmth to my skin, which I love for this time of year. It also has a true matte finish. 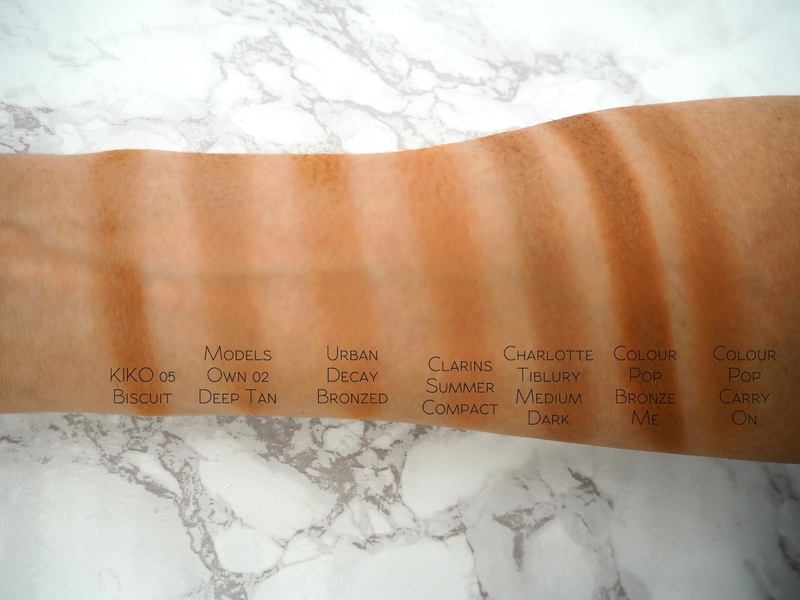 Urban Decay Beached Bronzer in Bronzed | £20 | Rounding off my favourite mattes is perhaps my favourite. I just find the formula so easy to work with; I literally just get a large fluffy brush and sweep it in a general '3' shape and within seconds I'm done. It gives me the natural warmth that's what I look for in a bronzer. It isn't too much darker than my natural skin tone, however it's pigmented enough. It's pretty much the perfect sort of colour for everyday wear. It is very warm so I can see that people with more neutral or pink undertones would find this orange, however it's pretty perfect for me. Clarins Limited Edition Summer Bronzing & Blush Compact* | £30 | I wasn't sure if this would be for me given that it only comes in one shade, however I ended up loving it! You can use the shades individually (there's a cooler matte and a warmer matte, then a shade with golden shimmer) or just swirl your brush around the outer ring for a colour that's warming with a slight gold sheen. When I'm feeling lazy I quite often just swirl all four shades together and apply this to my cheeks for a warm blusher-bronzer all-in-one cheek look, which is how I've swatched this below. I feel like the texture is that sort of 'good crumbly' because it makes it so easy to apply and blend out. Charlotte Tilbury Filmstar Bronze & Glow in Medium Dark | £49 | This palette is a funny one because the bronzer is perfect but the highlighter is one I can only really wear in summer; I kind of wish I could take the bronzer from this one and the highlighter from the light version! This is a slightly cooler bronzer with a dewy shimmer to it. If you want a warmer tone you can actually mix these two shades together. This is what I reach for when I want that dewy bronzed look as well as a little bit of definition. I know they say not to contour with a shimmery shade but this is perfect if you want definition that's really natural and fuss-free, without having to bother with a lengthy contour routine. I really like the smooth formula and the fact it's almost impossible to go overboard with this. ColourPop Cheek Shock Bronzer in Carry On | $8 | This has the same formula as Bronze Me, however it has a matte finish in a warm medium brown tone. I love the warmth it gives to my face and I'd say it's even easier to apply and more natural on the skin than my powder picks. It doesn't go shiny or wear away during the day either. For the price, you really can't go wrong! I recently purchased the urban decay beached bronzer and I'm not entirely sure if works that great with my oily skin. The CT bronzer is one of my favorites. Even though I'm a pale skinned girl I still read every word of this post as your writing just intrigues me; so interesting! I'm really surprised at the fact that the Models own one is really good considering it's such an affordable brand. I wouldn't normally go to them for products of quality but that one sounds great! 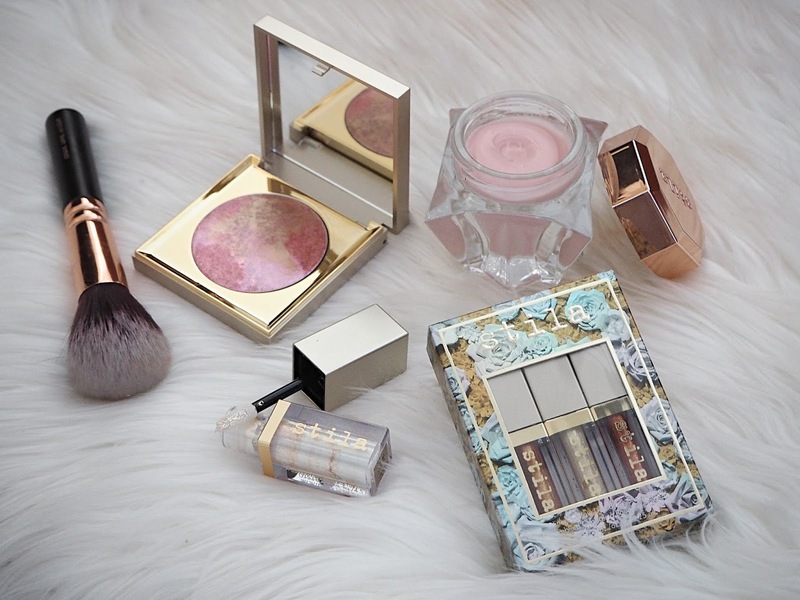 Beautiful picks, I don't use any bronzer because I don't know if it will suit me but I'm warm tone as well so I think I will pick one of those, the colourpop ones look great. 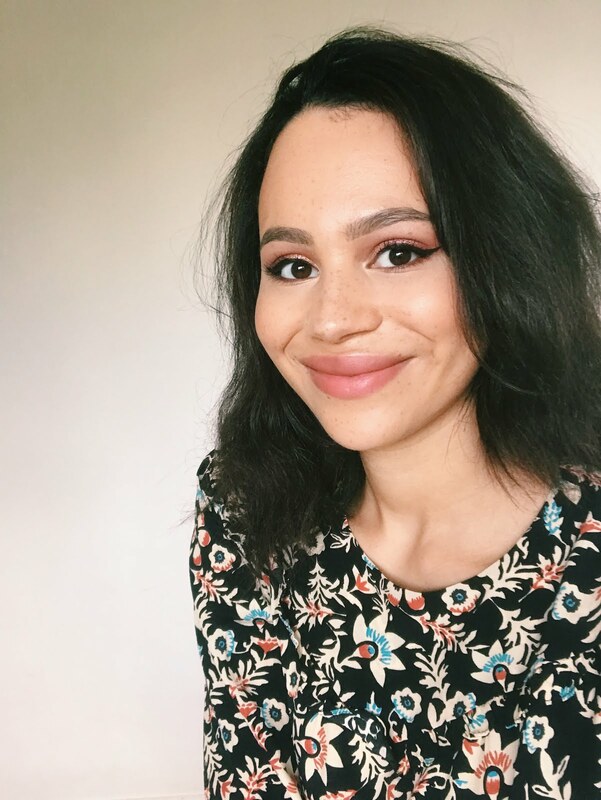 Thank you so much for this, Jasmine and yes, most of these posts are targeted for lighter, fairer skin so this is super helpful. I really like the Clarins bronzer, it's so pretty to look at and judging from your swatch, it would look great on my skin tone too. Ooh the Models Own one is a lovely shade! I love the Bronze shade from my CT Instant palette which is supposed to be the same as the light Bronze and Glow, so natural on me but I'm glad they brought another shade out! I really want to try the urban decay bronzer. I only own one bronzer- shocker I know! And its the bourjois one but I think I should probably throw it away, Ive had it for years now! Opps! Haha! 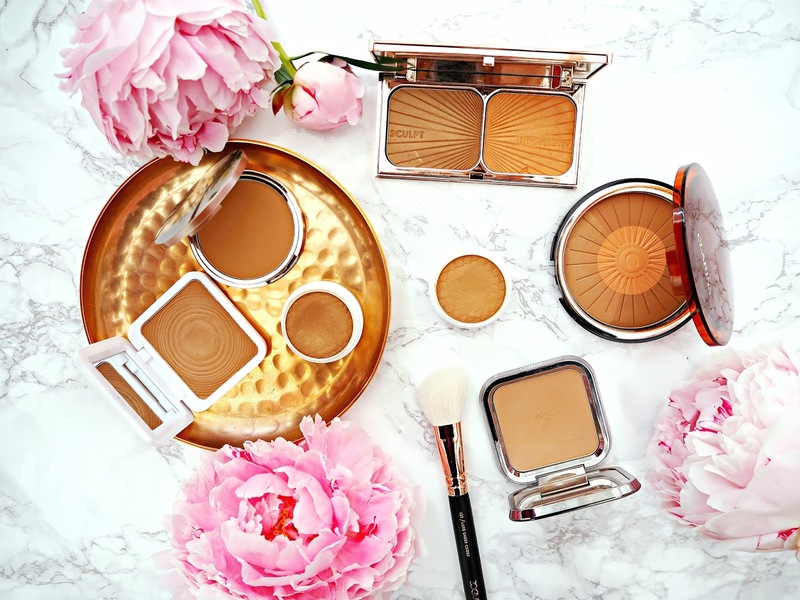 That clarins bronzer looks stunning! I loved this post, the photos were also really good! I used to have nice bronze skin, but I have been getting paler and paler as I grow older... my bronzers have definitely had to change over the last few years! I love CP bronze me and have my eyes on CP Carry on. UD bleached bronzer in Bronzed had my eyes on for quite some time but I wasn't sure of shades..looking at the swatches on ur blog, I think I should get this.